Useful, (not very) expensive hardware to buy for a laptop. All from Amazon! This is a range of useful hardware for anyone with a laptop , not just the physically disabled – the keyboard for example, is designed for the visually impaired, but would be usable for many people. I’ve been using these items myself for some time with no problems. Prices stated are at the time of writing. Xmini speaker at around £15, this is a well priced, portable and powerful little speaker; it has its own battery which can be plugged permanently into a USB port to keep it charged. A great replacement for poor laptop speakers. There are other similar speakers to this out there, but to my knowledge this is the only one which can be connected with up to 7 others to create some serious sound. Kensington Laptop stand – this stand was on sale at £10.33 at writing, very portable and useful for people with limited space. It seems quite fragile, but is really quite robust. Be aware that larger 17 inch laptops would not be appropriate with this item. Now that the laptop is further away and raised up to eye height, the built in laptop keyboard is not as usable; Most laptop keyboards are very poor for people with low vision, with smaller keys which quite often don’t have much of a raised edge; this is generally not very good to learn typing on, especially if you have low or no vision. A bigger and most importantly a usable keyboard is the order of the day. 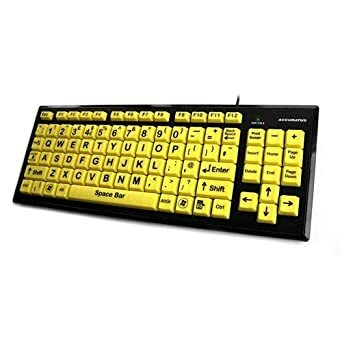 I’ve found the Accuratus range of keyboards great value, come in good combinations of colours to suit different needs: black letters on yellow keys, black letters on white and white letters on black. Even though the keyboards cost around £22, they don’t feel cheap to use.The keys feel responsive even though they are larger than usual with a simplified layout; getting around the problems that laptop keyboards bring with function keys and other complications. There are other combinations of colours to assist people with learning the keyboard layout as a whole. Now that the computer is ready to be used, people with some vision may well want to use a mouse, which is fine, but I tend to recommend older learners to use a track ball, which is also useful for those with limited movement. 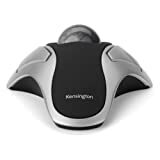 I tend to favour two Kensington items, the first option has good sized buttons and is well made (only £17! ), but more advanced learners who want to scroll up and down web pages will find a ‘scroll collar’ a much appreciated Orbit option for only £21. Put all these extra pieces together, and you have a partly portable work station for a disabled person or an older relative that doesn’t take up much space. If you have any comments or thoughts, please get in touch.